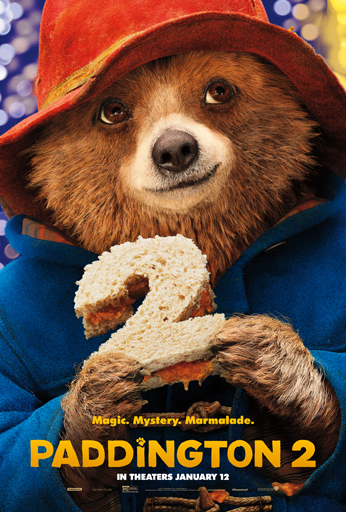 notes of jubilee: Paddington 2 - Coming Soon! Paddington 2 - Coming Soon! The kids and I watched Paddington tonight on Netflix. While they would claim to be too old for a movie that is based on a children's book (A Bear Called Paddington by Michael Bond), I can tell you that there were many smiles from all of us. Hugh Bonneville (Downton Abbey) brings all the wonderful expressions and outrage of a proper Englishman confronted by a force of nature in the form of a little wee bear with a "worrying marmalade habit." I laughed aloud several times, enjoying the comedic misadventures of the homeless Puruvian bear. Nicole Kidman, is a delightful stiletto wearing villain (if one can use those few words together with a clear conscience -- ha!) who has her own comedic moments with cleverly placed eye rolls and steadfast commitment to the role of museum taxidermist. I may be the least inhibited movie watcher of all of the members of our tribe of four, but more than one of us remarked upon the homages to Mission Impossible and Indiana Jones and various slapstick routines. The themes of politeness and hospitality shine through, making for an enjoyable family movie experience. January 12th is the day Paddington 2 arrives in theaters. If the sequel is anything like the first, moviegoers are in for a treat. Won't you consider checking it out? Following the worldwide hit Paddington, one of the most successful family films of all time, this much-anticipated sequel finds Paddington (Ben Whishaw) happily settled with the Brown family in London, where he has become a popular member of the local community, spreading joy and marmalade wherever he goes. You can find the official trailor for Paddington 2 by clicking here.